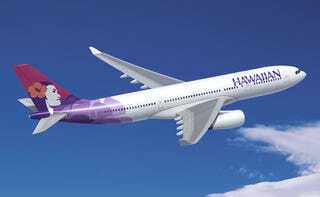 A Hawaiian Airlines flight bound for Honolulu from Las Vegas diverted to LAX after a passenger complained about the cost of a blanket. When the unnamed passenger asked for a blanket because he was chilly, flight attendants informed him that it would cost $12, rather than the $10 advertised on the airline’s website. So, the man called Hawaiian Airlines’ corporate office to complain and, in the course of the conversation, he said “I would like to take somebody behind the woodshed for this.” That was enough for the flight crew to get the plane diverted. The man was removed from the flight in LA, but then released without charge, because really, the people who should be charged with a crime are the ones who decided that a blanket should cost $12, or even $10. At the end of the day, which cost Hawaiian Airlines more—giving away a $12 blanket, or diverting an entire airliner full of people and burning a bunch of extra fuel?